Between the years of 1830 and 1927, as the last generation of blacks born into slavery was reaching maturity, a small group of industrious, tenacious, and daring men and women broke new ground to attain the highest levels of financial success. Mary Ellen Pleasant, used her Gold Rush wealth to further the cause of abolitionist John Brown. Robert Reed Church, became the largest landowner in Tennessee. Hannah Elias, the mistress of a New York City millionaire, used the land her lover gave her to build an empire in Harlem. Orphan and self-taught chemist Annie Turnbo-Malone, developed the first national brand of hair care products. Mississippi school teacher O. W. Gurley, developed a piece of Tulsa, Oklahoma, into a “town” for wealthy black professionals and craftsmen that would become known as “the Black Wall Street.” Although Madam C. J Walker was given the title of America’s first female black millionaire, she was not. She was the first, however, to flaunt and openly claim her wealth—a dangerous and revolutionary act. Nearly all the unforgettable personalities in this amazing collection were often attacked, demonized, or swindled out of their wealth. 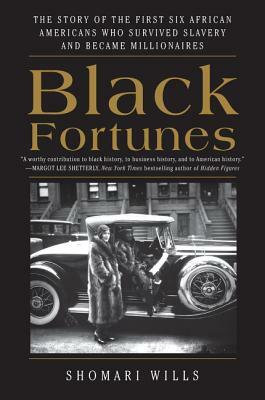 Black Fortunes illuminates as never before the birth of the black business titan.